Local police appear ready to charge a Pennsylvania man who they arrested last week after he asked Republican Sen. Patrick Toomey (Pa.) an uncomfortable question at a town hall that some say was "threatening." Northampton County resident Simon Radecki was removed from the meeting by Bethlehem, Pa. police, who said they would charge him with disorderly conduct and disrupting a public meeting, the Pittsburgh Post-Gazette reported Wednesday. "We've been here for a while. You probably haven't seen the news," Radecki said after thanking Toomey for appearing at the town hall. "Can you confirm whether or not your daughter Bridget has been kidnapped?" Toomey paused before Radecki attempted to explain his question, saying it was meant to make a point about immigration. "The reason I ask is because that's the reality of families that suffer deportation," Radecki said before Bethlehem police removed him as Toomey called the question "ridiculous." The ACLU of Pennsylvania weighed in on the incident, as the arrest and potential charges raised concerns for some civil-rights advocates. "He didn't disturb the meeting," said Vic Walczak, the group's legal director. "He was trying to ask a question." Walczak said he would "love to talk" to Radecki should he require legal assistance regarding the incident. Tim Fallon, CEO of PBS39, which aired the town hall live, said the exchange was "one of the scariest things I have ever been a part of." "All I was processing was ‘Oh, my God, what has happened?' … It was perceived as a threat by myself [and] folks I have had interactions with," he said of Radecki's question. Both PBS39 and Toomey's office said that the decision to press charges was made by the Bethlehem Police Department and not by Toomey. Police Chief Mark DiLuzio did not return the Post-Gazette‘s request for comment. 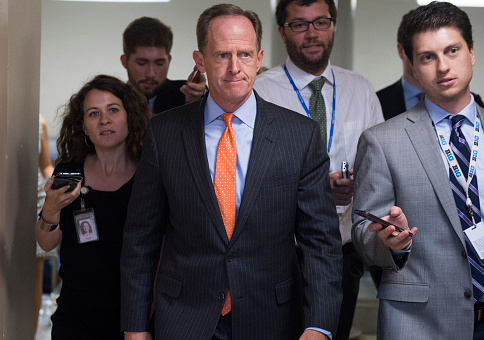 Steve Kelly, a spokesman for Toomey, said that the question was "reprehensible." "Asking questions that are based upon kidnapping a child is not only reprehensible, but it is inherently threatening," Kelly said. This entry was posted in Issues and tagged Immigration, Pat Toomey, Pennsylvania. Bookmark the permalink.